It's get-out-the-vote time in the U.S. Senate race, and both sides are going different routes to turn out their voters. ROUND ROCK — On Monday afternoon here in this Austin suburb, the leading get-out-the-vote operations for both sides in the U.S. Senate race were in full swing. Situated just houses apart in the Jester Farms neighborhood, a group of block walkers for Gov. Greg Abbott’s campaign was traversing door to door, while a “pop-up office” working to elect U.S. Rep. Beto O’Rourke, the Democratic Senate candidate, was humming with activity. There were ample signs of the political battleground traditionally Republican Williamson County has become — O’Rourke’s literature was already inserted in some doors that Abbott ground troops encountered, and they recalled running into rival block walkers with regularity at this point in the election cycle. The scene illustrated the dueling get-out-the-vote strategies in the U.S. Senate race. 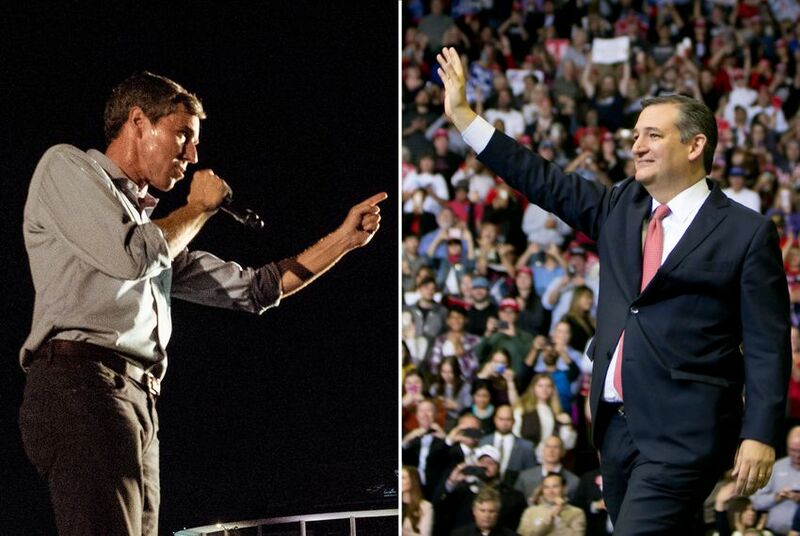 The Republican incumbent, Ted Cruz, is relying on the political machine created by Abbott, and O’Rourke is betting on a massive in-house operation that he has touted as unprecedented in Texas. Such programs could make the difference in a race that has consistently polled in the single digits, with Cruz not-so-comfortably ahead in recent days. The effort is especially important for O’Rourke, who is aiming to turn out traditionally hard-to-reach irregular voters — and new ones. “Though we haven’t taken a dime from a single PAC, we’ve been very fortunate the number of Texans who stepped forward — five, ten, 15 bucks at a time — they are funding the largest field program that you’ve ever seen in this state,” O’Rourke said, speaking with the media after a campaign stop in Austin. “In every one of the 254 counties, we’re knocking on doors — more than a million doors knocked on just since the get-out-the-vote effort started in mid-October. We may do a million more before this is all said and done on the 6th of November. So that money is going to support people talking to people, and those people deciding the election of our lifetime." Cruz has told reporters his campaign and Abbott’s are working “very, very closely” on turnout efforts, and Cruz’s campaign referred questions for this story to Abbott’s. Asked about the dynamic Tuesday, Abbott kept his response focused on the whole Republican ticket. Still, GOP insiders see Cruz benefiting uniquely from Abbott’s machine, especially in the absence of a robust field program housed within Cruz’s campaign. Such a program could cost a campaign tremendously — and Cruz is relatively tight on money after having been badly outraised and outspent by O'Rourke throughout the race. To be sure, the Cruz campaign pays several regional field directors and has plenty of volunteers, but its investment in the area appears to pale in comparison to that of Abbott and O’Rourke. The difference can be seen in the campaigns' periodic reports to the Federal Election Commission, which do not detail field staff but show how many people a campaign has on payroll overall. During the most recent period — the first 17 days of October — Cruz’s filing had 18 people on payroll. There were 805 on O’Rourke’s, according to a Texas Tribune analysis. On top of the paid staff, O'Rourke's campaign says it has recorded over 25,000 volunteers since its get-out-the-vote program launched Oct. 5. O’Rourke has built the operation out of necessity as much as design. With Democrats long out of power in Texas — one has not won statewide office in over two decades — the party’s infrastructure is in notoriously poor shape. For Democrats, it is a different setup from the last time they had a star at the top of their ticket — Wendy Davis — in 2014. For her field efforts, the gubernatorial nominee relied on Battleground Texas, the group that launched to much fanfare earlier in the cycle. “It’s a big difference,” he added, "and it’s going to make a difference." Arguably the centerpiece of the O’Rourke campaign’s ground game in the home stretch are its “pop-up offices” — 727 in total. The offices, located in supporters’ homes and other places, serve as local organizing hubs, the site of volunteer trainings, phone banks and canvass launches. Paid field organizers oversee clusters of pop-up offices in their regions, but each location is otherwise entirely run by a volunteer known as a “pop-up captain.” The captain is responsible for opening and closing the space, maintaining it and leading trainings at the start of each shift. Around 3 p.m. Monday, the Jester Farms pop-up office was beginning to fill up. A half dozen volunteers were spread throughout the house, including two stationed in a guest bedroom where the owner had cleared the floor — a mattress lay against the wall — and built a table for volunteers in place of the bed. The office’s captain, 45-year-old Leyla Gaines, said O’Rourke’s was the first campaign she has ever gotten involved in and has been working 12 hours a day every day since early this month. “Everything else is on hold,” she said during an interview. After first winning election in 2014, Abbott did not shut down his campaign, keeping 12 regional field directors in place. Since then, the operation has grown to include 125 paid field staff, plus about 7,000 “super volunteers” who have gone through the campaign’s training program, known as Abbott University. Altogether, Abbott has invested $17 million in field this cycle, according to his campaign. The effort is fueled by people like 22-year-old Madison Huerta, a recent University of Texas graduate who serves as the campaign’s Central Texas regional director. She and two other Abbott field staffers, donning Abbott gear including T-shirts and lanyards, took turns knocking doors Monday afternoon in Jester Farms, first asking people if they planned to vote for Abbott — and then Cruz. Over the course of an hour and a half on Monday afternoon, Huerta and her fellow block walkers did not have to do much convincing, encountering a number of people who had already voted Republican — and were well aware of the marquee race. With his machine, Abbott is looking to influence Texas politics long after Tuesday, and he has spoken about running not only to win another term but to also "win the next generation." O’Rourke’s supporters too believe his get-out-the-vote operation can endure beyond Tuesday. “I feel that we’re doing all that we can, and no matter what happens on Nov. 6, that we have changed the way politics is going to be done from here and well into the future,” Gaines said.